What’s the safe daily amount? The FDA in the States say no more than 400g per day – total. First, some caffeine is fine. And yes, some coffee is fine too. In fact, it’s been linked to health benefits, and it’s no longer a banned substance in Sport (because the more you have the more you need for any advantage in performance). The problem, of course, is with too much caffeine. From jitters to anxiety to visits to A&E with suspected cardiac problems. The world has over-caffeinating itself to the point of addiction. Coca-Cola. It’s a caffeine lightweight at about 50mg per can. Caffeine is found in cold and flu medications and energy drinks too…. Red Bull. A small can packs only 80mg. Did you know that each can of Monster gives you 160mg of caffeine? At Starbucks, a venti-sized brewed coffee exceeds the FDA’s daily recommended limit with a whopping 415mg of caffeine. That said, a “short” 8oz cup provides only 75mg. 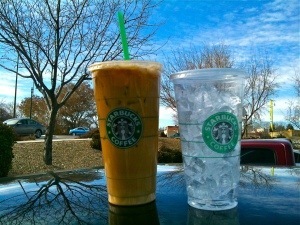 So if you go to Starbucks, take it easy on their monstrous sized beverages.